The National Football League’s 48th season began on September 17th, 1967. It was the first season in the history of the NFL to have a playoff after the regular season had ended. The previous 34 seasons had only included one post season game which was the championship game consisting of two teams with the best record (the NFL champion was the team with the best record during the first 12 seasons of the NFL). The NFL expanded to 16 teams with the newest being the New Orleans Saints. This allowed for a post season that included a four team playoff for the championship. The 1967 season paved the way for the current 12 team playoff structure. The first game of the playoffs took place on December 23 and pitted the Los Angeles Rams against Vince Lombardi’s Green Bay Packers. The game was played at County Stadium in Milwaukee, WI. The Rams drew first blood with the first touchdown of the game but would give up four consecutive touchdowns before the game was finished. The Packers would win by a score of 28-7. With that win the Packers were on their way to the NFL Championship Game. The second playoff game took place at the Cotton bowl in Dalls, TX on December 24th. The teams competing for a trip to the NFL Championship game were the Cleveland Browns and the Dallas Cowboys. The Cowboys won the game in blowout fashion with the final score being 52-17. With that win the Cowboys would advance to what would become one of the greatest games in NFL history. The NFL Championship Game was held at Lambeau Field in Green Bay, WI on December 31st. 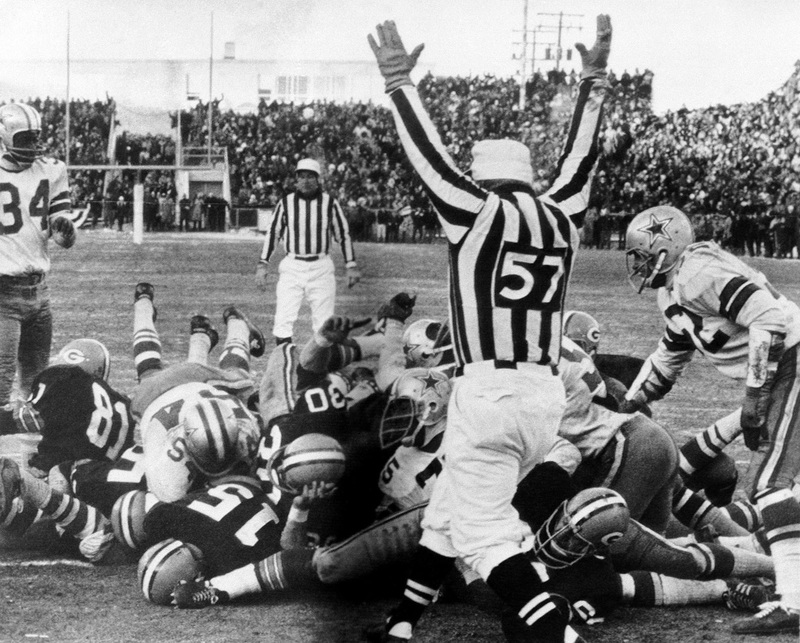 The game was dubbed “The Ice Bowl” due to its game time temperature of -15 F, the wind chill was -48 F. The Cowboys took on the Packers in this epic contest. This game was a brutal and very close game that went into halftime with the Packers leading 14-10. The Cowboys took the 17-14 lead with a 50-yard touchdown pass by running back Dan Reeves to wide receiver Lance Renzel in the 4th quarter. But the biggest play of the game would be one of it last plays. With just 4:50 remaining in the game the Packers quarterback Bart Starr led his team down the field, Starr would be the man that won the game for the Packers when he ran the ball into the end zone with just seconds remaining on the clock. The final score was Packers 21 and the Cowboys 17. To this day it is considered by many the greatest game and from what the players endured and the result on the field there is no arguing that. The Packers would not only go down in history that year for winning the first ever NFL Playoffs but would also win another important game in their history. Two weeks after the NFL Championship game the Packers played the American Football League Champions the Oakland Raiders in Super Bowl II. The Packers would be the victor in that contest as well and continued what is viewed now as a “Dynasty Team”. The NFL took an important step in their history in 1967. A step that has lead to some of the most iconic games in the sports history. Who know the next great NFL Playoff game might be the next. This entry was posted in NFL, sports, Sports History and tagged 16, 1967, 1968, 2, afl, bart starr, browns, championship, cleveland, cotton bowl, county stadium, dallas cowboys, Dan Reeves, expanded, expansion, first, greatest game, green bay packers, hall of fame, HOF, ice bowl, II, LA, lambeau field, Lance Renzel, los angeles, new orleans saints, NFL, playoff, playoffs, rams, season, super bowl, teams, texas, winner. Bookmark the permalink. Great point, It makes one wonder Hank, thanks for reading brother. That would have been to cold for me to walk out of the house lol. With law suits flying around daily especially in sports which is a much larger business model today than it was 40 years ago, I doubt that game would have been played. I agree Hank, the game would have been postponed immediately. It was such a horrific injury some of the fans passed out and supposedly 2 people had heart attacks and 3 players threw up during this scene. I hope nothing this bad ever happens again. Thanks for the retweet Hank.